Berman Post: Obama Used a Teleprompter to Talk to Sixth Graders? Obama Used a Teleprompter to Talk to Sixth Graders? 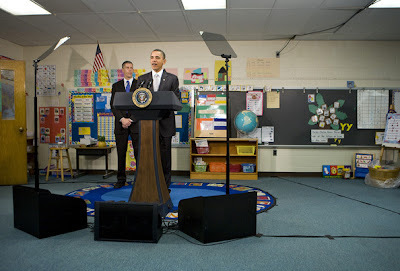 Picture seems to indicate such, but I would think (hope) that Obama needed the teleprompter for some prepared national remarks as apposed to just talking to some elementary school kids. Berman Post: Obama's Teleprompter Blunder on St Patrick's Day Was Actually a Joke? Berman Post: "Obama's Home Teleprompter Malfunctions During Family Dinner"